foreign trade area in which the nierchandisewasunladen. cluded in the inbound data only in the other hand. / -.- th.n hill' 1 the unit of measurement hown. BS.NA. INA A. .. A .
SAN ,~AN P.R. *. 2 |... 2B .8 3 ..- '. AT q; | 1 172 I 80 20 20 2 35 5 . O .. . -.. I. * -. 2O++* ++OZ 0 . " PORT SAN LUISI CALIF. 1 1 ... . I .-- .. .. .
B. AY',.- .. -- .
.* .. .. .. .
.C- I ..... . .
.AT O. ., Ml'.. ... .
A A (0 .. t .. .
EAST COAST OF SOUTH AMERICA . WEST COAST OF CANAL ZONE. PORTUGAL AND SPANISH ATLANTIC . WEST COAST OF AFRICA.. .
INDIA, PERSIAN BULF, AND RED SEA. :1 l i .. *', x- 3 .l i I 1 l .
I'e. .t'v I. 3 .: . EAST OAST OF CANAL. ZONE. L .
A.. OT7U* CARKBEAN PORTS . (AST COAST OF SOUTh AMERICA . *CST COAST OF SO.TM ERICA . A.t OTt. *ST CST OAT OF CLNTRA. AR(ICA *N Meai 0 .A.. .
Wdf COAST OF MtAXCO. .
UN:ITEL tN600 AND 4E1 R t .
AO ETN OE OAS T OF POTAL.. .
*EST COAST OF AFRACA. .
AL. OTHER *EST COAST OF AFRICA. 50UTN AEt) LAST AFRICA . INOIA, PE S1AN RLF A1F RED >tA. "AA 5AV AND INOOES!A S .
tC .. i .t 'AleA AN. AOTh .~ \' N. A ..
EAST COAST O A OF A ... ZO. .
A N ER4 CA-BEAN E PORTS . *l5T COAST OF C %N. ZON . TF COAST OF HIICO. .
ITED, INOOM AN LIRE . SOUTKEAS OF PORTJ6AL. A L .
ALL OTiER WEST COAST OF AFRICA. SOTi AND EAST AFRICA . INDIA pERsiAN bULF AND RE SEA*. EAST COAST OF CANAL ZONE . GULF COAST OF MfXICO . UNITED KINGDOM AND EIRE. .
WEST COAST OF AFRICA . SOUTH AND EAST AFRICA. .
L ,- 6 .A'.1. : % .'. . CA I 'AN A. . CAST COAST OF CAhNA. ZONE . LAST COAST OF SO TN AMLRZCA. .
*aST COAST OF CANAL O . A N EE.AD. . .
S .MA .-A.T .ANTIC t .
PORTiAl ANO SPAN 5S ATLANT1C. SOTH ANA EAST AFRIAA. .
ALSIA AND0 P *OONESI* . 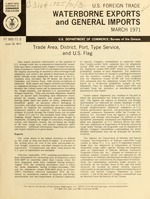 MARCH 1971 U. S. WATERBORNE IMPORTS 1. O4T LPU, LA . * .. -. .
MMP TN.. ,....... . .
C JATTA tA* T.h. . .- .. -. ... .
PO U* T...... .. ..S. 7 .S 2 1 1 . AW ft .... . . I ; 1. I A I t 14 .A . ABERDEEN-HOQUIAM, WASH .. -- -. .
BLAINE, WASH.... : : : : : : : : : . * *.-.t*r g." : ~ i .l", **s *~ .M *. l ac.J00 ". -. *,~ rr~ '':01; Lee. PE BITNA. N. DA< . .
ASANDO. *1I.. 1 i. .
! '[EQ Y'*L FALLS-MANIE aMIN. .
nA 4 Bt. I IN. ... .
"Rts l rrT u.. . .
"A' I .' ;0CN .. . .
;-.BO"aT AN A, E.- .. .
A-CI I 1C-. .. .
SA.L' '.TE. AB IE. . .
-. Ars:%. s IC . C: T- -A.. I. ... .
a" :fa,. C .. .
Srr AA t 1 A .. . .
S.fA.L' 4* Int Iv uimlA lulT &Nf. At1' i Ii C .. .
figures, hence may vary slightly from sum of rounded imou.. I *f :' r;L 1. L *'. *',"
".' ._ "A', . .
AT COAST OFT CANAL ZNE. .
A OER CARI BBEAN PORTS . EAST COST OF SXT .' AMERICA . g*T COAST OF 5OT* AMERICA . ST COAST OF CANA. ZONE. .
SOUT.~ AND EAST AFRICA* . INIA, PERSIAN .P.. *AN REDO SEA. AT ANTI CANADA .. .
- '. ** -, e.."*- 'r- -- "
EAST COAST OF CANAL ZONE (Z) . -c w e s. . .
i --En" :A, BC, S .H . '-Er ; a h . .
r A -a' :.r A- T E A. 5 I . '* '. iSP C ,. '; 6 T .
RF'. F s*' . .
:* -(- b n-;- A%[" B[. .
.' :'S-&r-' T. A,: BE......" . A A r, I A .. .
*E :AS' C A :ER: A. ..
.'.IA ANr C. E A . *B rB ; 'rR- :C -MEi*. '. .' t. I-." :A. ,c -C. .. .; E" .t. 4 L L. *i. A .. .
,A. .-- : *- :...- t .